Find great deals on designer clothes, accessories, shoes and more on a shopping tour to Tanger Outlets from Houston. Leave the driving to the professionals as you relax with round-trip transport by deluxe minivan from downtown Houston to one of the most popular malls in the region. Your full-day tour begins with a 75-minute Houston city tour on a double-decker bus. See all of the major attractions and landmarks around downtown, including Chase Tower, Historic district,Buffalo bayou,City hall, The Sam Houston historic park,Minute maid Park and the Houston Astros’ home ballpark. Mid town and more. 6 hours includes Houston City tour & travel time to and from Outlet mall. Make your own way to a convenient downtown location in the morning to board your double-decker bus for a Houston sightseeing tour with informative commentary on the city’s top attractions. Travel by open-top bus on a 75-minute tour that takes you by Chase Tower, City Hall and Minute Maid Park — home of the Houston Astros baseball team. Pass Houston’s City hall, Sam Houston park, historic district, Mid-town and more. After touring central Houston, transfer to a comfortable minivan for the 35-minute drive to Tanger Outlets in Texas City. 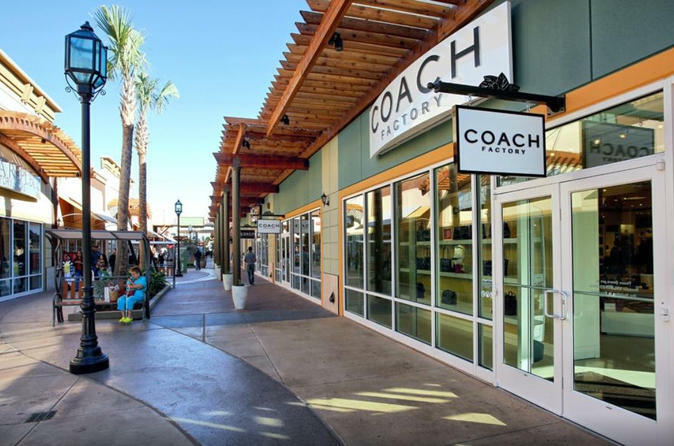 The large outdoor mall features close to 200 outlet stores — with steep discounts on premium brand-name and designer clothing, accessories, shoes, jewelry, electronics, housewares and more, with deals suitable for the entire family. After approximately 3.5 hours at Tanger Outlets, meet your deluxe minivan at the designated place and relax as you travel back to Houston with your shopping finds.